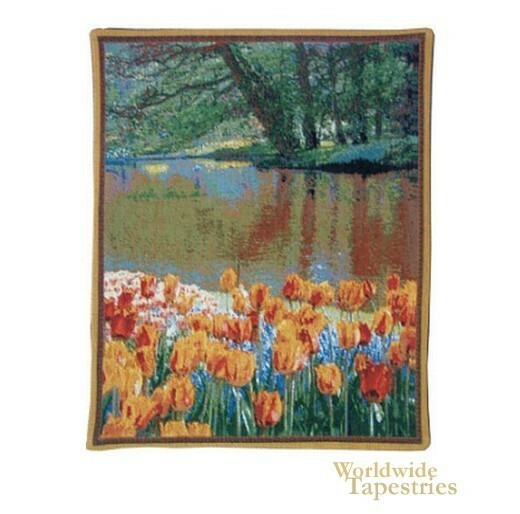 Kuekenhof I - Mini Right Panel tapestry shows a scene from the gardens of Holland. Full of grace and beauty, this scene shows the orange red tulips in full bloom, before a lake, with beautiful woods beyond. On the far bank, there is a hint of color to reveal glimpses of more tulips to delight the visitor. This Kuekenhof Mini Right Panel tapestry is backed with lining and tunnel for easy hanging.